Photographer's Showcase artist Mark Menjivar's "You Are What You Eat" series has recently been featured on NPR's The Picture Show blog.You can find the blog post here. Menjivar has been interested in the issues of hunger and our personal relationships with food. 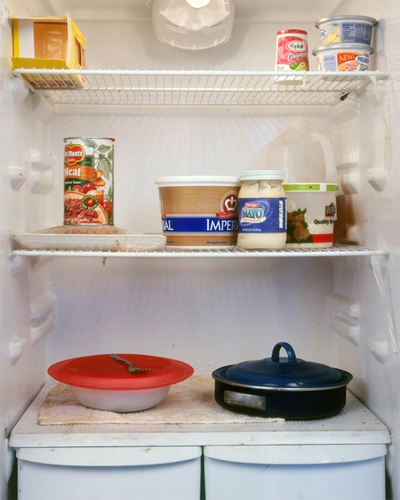 His "You Are What you Eat" series documents the interiors of refrigerators, capturing what the contain at that very moment, nothing added or removed. When viewed as a whole, these images end up being a series of portraits -- it's almost surprising how telling these interiors are of the refrigerators owners. Pick up a copy of the December issue of ARTnews to see a review of Gallery artist David Trautrimas' "The Spyfrost Project." Trautrimas' most ambitious project to date, "Spyfrost" present a series of fictional secret military installations based on Cold War architecture. If you look closely, you can pick out some of the often household items that make up Traturimas' constructions, though a number remain mysterious, creating a wonderful tension between whimsy and the feeling that something isn't quite right. Trautrimas' quite scenes are always more then they seem at first glance. 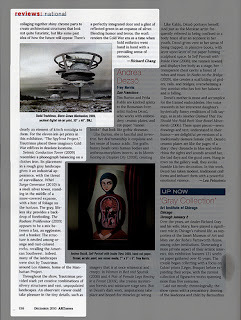 View Trautrimas' work at photo-eye Gallery here.